"There’s a time and place for patent shoes. They’re the swankiest moments of your life, when you’re dressed to party, and need a proper shoe to dance and strut proudly. 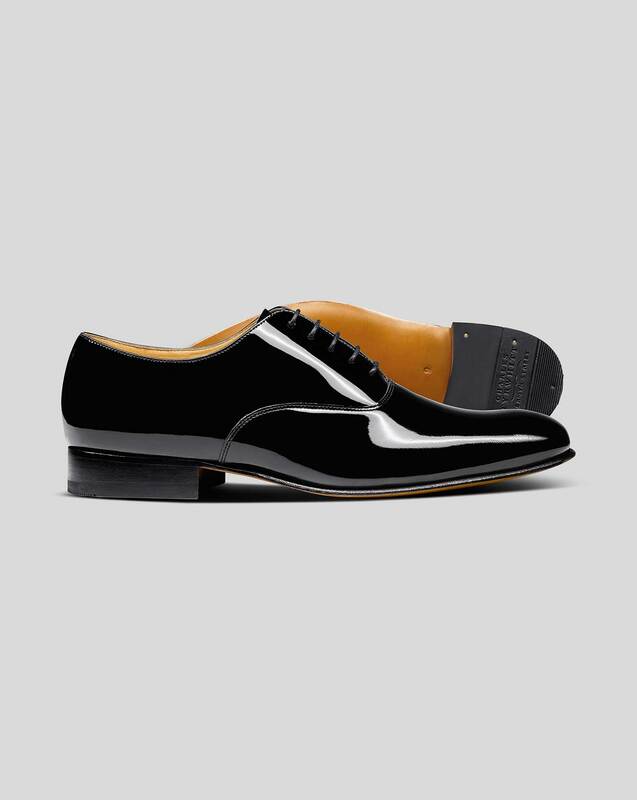 We use high-quality premium patent leather to make them comfortable enough for you to not miss out on any of the fun." "Patent Oxford shoes made from premium leather with a refined finish. Ideal for occasion dressing." Greater shine than appear on the photos ! Excellent shoes as expected from Charles Tyrwritt. A very good fit. Smart dress shoes. Slightly smaller than stated size (about 1/4 of a UK size fitting, e.g. size 10 was closer to 9 3/4). Leather soles are only a few mm thin - suitable for wearing inside a function, and crossing short distances into a building from a car, but unlikely to survive walking outdoors for more than a few 10's of yards without being spoiled - take another pair of shoes for getting to/from an event. Perfect fit and very comfortable dress shoes.